"We are not just focused on the technologies of the future, we are obsessive about the people that will create them." It's predicted that by 2030 a vast number of new technology jobs will be created, many that don't even exist today. And it's the reason behind Adastral Park playing a leading role in encouraging youngsters to study the core STEM subjects - science, technology, engineering and maths. On offer is a wide and diverse range of computing events, all of which have been designed, developed and tested with teachers across Suffolk to make sure the learning is joined up with the curriculum. Technologists from across the park volunteer to deliver these free events and guide school children through exploring the showcases and workshops. Students leave having experienced an interactive look at science and technology in the real world. It's events like these that can really bring it all together for the next generation. And with technology underpinning everything that we do today, the skills needed are critical to the future digital economy. During January 1000 + students aged between 7-8 years old attend workshops held by BT volunteers at Adastral Park. Our portfolio of events are all free to attend and open to any school to attend. All activities are designed to support the curriculum and provide important work-based experiences. They range from supporting national initiatives such as British Science Week and the IET Engineering Open House to workshops that support the heart of the curriculum and lead to the opportunity to take part in UK finals. Teachers are also supported with their own workshops and the Barefoot Computing Programme. 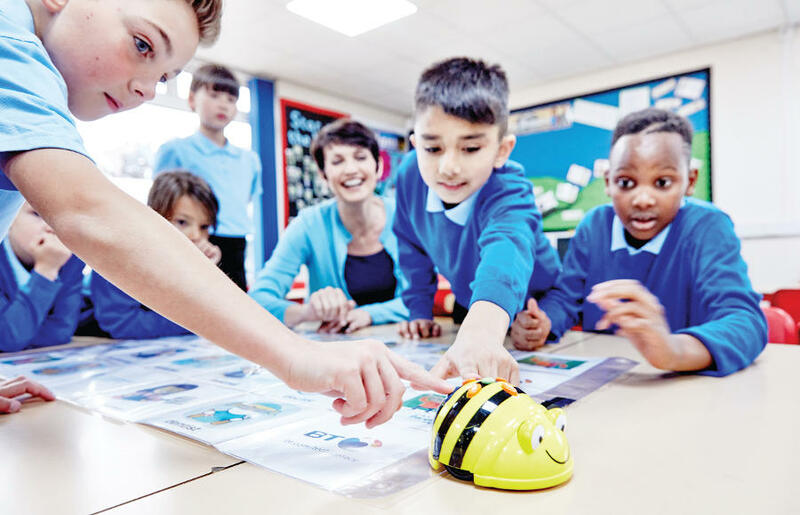 This session develops students' creativity, team work, problem solving and reasoning by providing a taste of programming using robots to undertake a variety of tasks. A second workshop is available to develop the skills further and to take part in the regional RoboCup Junior Line tracking Final. Computational Thinking gives students access to a set of tools to improve reasoning, perseverance and problem solving. This interactive session for students will use a variety of activities, both unplugged and programming environments, for example ScratchJr, WeDo and BeeBots. Activities were varied and pacey, well-resourced and plenty of staff to help – thank you! Do you have access to micro:Bits but unsure how to use them? Would you like to give your students a new experience? This interactive workshop will give students a taste of programming a micro:bit to complete a range of tasks. The workshop assumes no knowledge of using a micro:bit. This interactive day enables students to develop the skills to program a virtual robot in a virtual environment. It takes them step by step through creating a program, moving the robot around the screen, picking up and depositing tokens as well as avoiding traps. After the day students can carry on developing their programs at school, take part in improver day workshops and enter for the UK RoboCup Junior Final with a chance to qualify for the International Finals. The competition side of it is good because it makes you interact with each other a lot more rather than just in a class working on your own computer you go to other trams you collect ideas, you share ideas and then when it comes to actually coming into the battles you have a competitive side to you where you want to makes yours better and then being judged it also just adds to that you want to make it the best you can, you want to learn the most you can from this. BT will open its doors to students from across East Anglia to experience the feel of an university type lecture in a fun and interactive environment. This year's topics will be "Cyber Threat Hunting" and "Machines that make up their mind". We run an outreach programme with the aim to bring workshops into the local community across the region. These events can be hosted at various venues across the county including West Suffolk College, Horringer Court Middle School and Woodbridge School. We are extending this to in school workshops for the Key Stage 1 (age 5 to 7) students. More than 1500 school children from across 60 Suffolk schools spend a day at Adastral Part as part of British Science Week - an annual ten-day event celebrating science, technology, engineering and maths (STEM) from the British Science organisation. It's a great way for kids to experience today's technology and for teachers to get a helping hand in promoting STEM in the classroom. The week can make a real difference to students, creating a lasting impression that could inspire a future STEM career. If your aim was to inspire the younger generation, then I would say you have achieved your mission. We have already had a couple of our 'drifting' pupils find us outside of lessons and ask for extra maths/science work to do over weekends 'so they can get a job doing the cool stuff we saw!' As a maths and DT [Design Technology] teacher myself, being able to show them what their lessons can lead to makes their learning so much worthwhile, and my teaching so much easier! You've heard of RoboCop, well now there's RoboCup Junior. No, it's not part of the film franchise, but an exciting and challenging international competition open to pupils who compete in computer-based robotic challenges. For the past few years Adastral Park has hosted a series of taster and advanced days for students aged 9-18 culminating in the UK National finals of CoSpace Rescue and OnStage as well as Regional Finals of Line Tracking, all held in the Spring and Summer. The young programmers are tested on their ability to solve problems, analyse the effectiveness of different strategies and write code. In 2016, students from Beccles Free School in Suffolk went on to win the World Championships in Germany - a fantastic achievement - and a promising sign for the UK's digital future. RoboCup in general gives the students the opportunity to get involved with the hardware and software ... we've got robots, we've got sensors, we've got actuators, and then the software is like the glue, it's the clever part that puts all those parts together. And increasingly in a world with artificial intelligence that's where we need the skills for our young people particularly in the UK today. This event gives young people the chance to find out more about the exciting stuff that goes on at Adastral Park and gain hands-on experience and insight into careers relating to the STEM subjects. The session includes a visit to the Innovation Showcase area, which highlights how the latest innovations and technologies from around the world transform a variety of industries. The day also gives an opportunity to hear from our engineers about how being an engineer helped their career. Today's teachers are key to the next generation's success. Barefoot supports primary educators with the confidence, knowledge, skills and resources to teach computer science. Resources aligned to the curricular for all UK nations. This includes free high-quality lesson plans and local CPD (Continuing Professional Development) Workshops, all designed to help teachers gain confidence in bringing computer science to life in the classroom. Since 2014, we have supported 33,000 teachers across the UK. If you'd like to find out more about educational opportunities at Adastral Park, please email computerscience@bt.com.